It is the 16 of June 2011 day 33, 7C, and we break up camp in Twillingate and set our GPS for St John's, the capital of Newfoundland and Labrador. As we get out on the highway the rain and the fog get more and more intense. Second gear on the wipers do not do much, and a snow plow seems appropriate for the fog. Along the way we stop for a "Jiggs Dinner" at a highway diner. This is, I'm sure most of the time very good. But there is always an exception to the rule. We found the exception, darn, and I was hungry. Jiggs Dinner typically consists of a combination of pickled salt beef (and I mean salty), boiled potatoes, carrots, cabbage, turnip, turnip greens, bread pudding, dressing, pease pudding, and a cooked turkey, chicken or roast beef. We did not see any turkey, chicken or roast beef but a pice of meat-like material that tasted like salt. Condiments for a Jiggs Dinner sometimes include mustard pickles, pickled beets, cranberry sauce and butter. Well we left the diner with 12 liters of water, just in case. It was all gone by the time we got to St. John's. We arrived in St John's and set up camp in Pippy Park Campground right in St John's. An absolutely wonderful park close to everything. Full service hookup. We booked in for three nights. Anders.... Lost? Looking for a pub? St John's is a very scenic and picturesque city with about 200,000 inhabitants. It is on a small bay with a very narrow inlet. June 17th 2011, we needed an oil change on the truck by Hickman Chrysler on 20 Peet Street. Super good service and very friendly staff. The price was almost half of what we pay in Victoria? You figure that one out. Meanwhile Liz gets a haircut during the oil change in the shopping mall next door to the dealership. I do the husband thing, and sit on a bench and pretend that I'm busy on my phone sending messages. After lunch (no Jiggs Dinner today) we head out to Cape Spear, the most easterly point in Canada and a National Historic site (again it's free with your annual National Parks Pass). Here we are actually only 4,500 km from Zurich Switzerland and 7,500 km from Victoria. Got to love this big country of ours. The oldest surviving lighthouse in Newfoundland and Labrador is located here, at the most easterly point of land in all of North America . It has been restored to its 1839 appearance and shows how a lightkeeper and his family might have lived in the mid 19th century. Can you see the light house? The Cape Spear visitor centre includes an exhibits on the history of lighthouses and the tradition of light-keeping. Cape Spear is surrounded by spectacular scenery and wildlife such as whales, seabirds and icebergs in season. During the World War II, a very different kind of danger focused activities at Cape Spear. German submarines and raiders off the coast of the Island posed a considerable threat. A coastal defense was necessary, and a battery equipped with two 10" guns was put in place to protect the entrance to St. John's Harbour. The gun emplacements were built at the tip of the Cape and connected by underground passages to magazine and other rooms. What the old light house looked like on a day without fog. Further from 1941 to 1945, troops were stationed here, and the construction of barracks, mess halls and canteens were quickly under way. Liz and one of the staff or Parks Canada inside the old light house. The light house is fully furnished the way it was back then ( the oval shield is to protect the face from the heat of the fireplace). With the end of of the war in 1945, most of the fortifications were demolished however the gun stand as a sombre reminder of that important period in Canadian military history. Next on the list was Signal Hill right in St.John's. This National Historic Site is preserved in celebration of the rich communications and military history of Signal Hill. 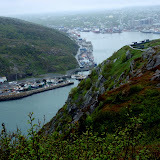 Signal Hill overlooks the sea and has a spectacular view of the city of St. John's. Again bring your annual National Parks Pass for free entry. Signal Hill was the reception point of the first transatlantic wireless signal by Guglielmo Marconi in 1901. Further, it was also the site of harbour defences for St. John's right from the 18th century to the World War II. Here we enjoyed a spectacular hike from the administration building up to the summit. Liz and Anders with St John's in the back drop. Both Signal Hill and Cape Spear should be on your list when visiting St John's. The Rooms is an art gallery, archives, museum, cafe and gift shop. The architecture alone of the building is fantastic. Here you can immerse yourself in the culture of Newfoundland and Labrador. It's the place where it all comes together. The history, heritage and artistic expression, it's all there. The Rooms unites the Provincial Archives, Art Gallery and Museum. The building soars into the skyline of historic St. John's, and combines 21'st century technology with a striking visual reference to the past. Its unique design mirrors what is referred to as the "fishing rooms". This is where families came together to process their catch from the sea. The Rooms today is also a place to gather. Here you will find collections, exhibits and programs that tell the stories of Newfoundland and Labrador and interpret the natural world through art, artifacts, archaeology, architecture and archival records. Sorry there are no pictures of the wonderful artwork - no pictures allowed because of copy right law. Even though I'm no crazy about stuff like this, I truly enjoyed the visit to The Rooms. Plan on spending at least half a day here. Petty Harbour-Maddox Cove is a picturesque old fishing town of approximately 950 people. The town is located on the eastern shore of the Avalon Peninsula about 15 minute drive from St John's. The drive out there is wonderful and scenic. Chafe's Landing..... stop for a bite. It' awesome. Petty Harbour-Maddox Cove is around 200 years old and is the site of the first hydroelectric generating station in Newfoundland and Labrador. It is further home to a wonderful place to have lunch.... Chafe's Landing! Wonderful food, plan on lunch or dinner here. The seafood chowder and lobster roll is some of the very best! For more pictures from this part of our trip, check out our Picasa Web Album.